Yes, everything else that we offer can be found on this page. To wit: Oven Push-Pulls, Bottle Stoppers, Pickle Forks, Counter Scraper and Stand, Salt Cellars and Salt Spoons, Spoon Rests, AND our Special Oil. Please scroll (or stroll) around and see what catches your fancy. A couple came into my booth with their youngish daughter who was learning to cook. She showed me the burns on her arms. Her parents got her a carefully-chosen rack pull and she came back the next year to show me her clean arms. She said that her cooking had improved as well! The Fish Pull was a customer's suggestion. The tail keeps the pull from getting away. 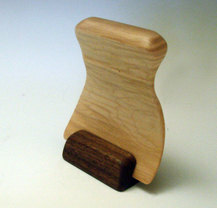 These push-pulls fit comfortably in your hand - especially nice if you have trouble gripping. They are designed so that you can pull - and then push back in - hot oven racks. We saw an antique pull in a Cooks Illustrated magazine. and dressed it up in pretty wood with a hanging hole. Both designs work equally well in a toaster oven or regular oven. 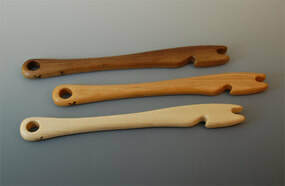 Three-tine in Cherry, Maple, and Cherry. 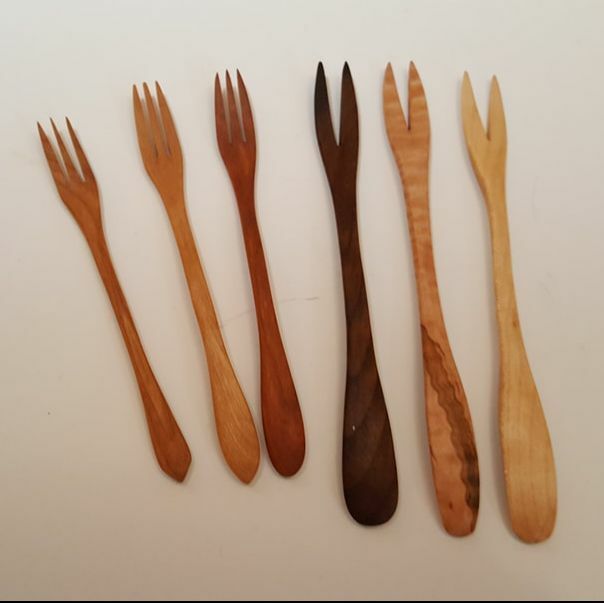 Our delightful little forks for those zesty, juicy morsels that we love to munch. Set them around your holiday table, or include as a gift with your home-canned edible gifts. 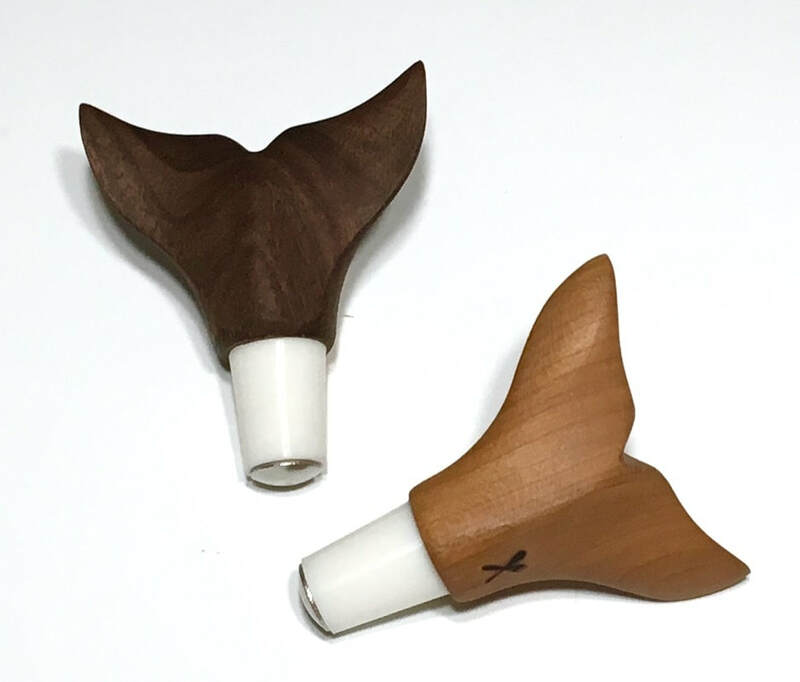 A creative gift for the wine or craft-beer lover in your life! 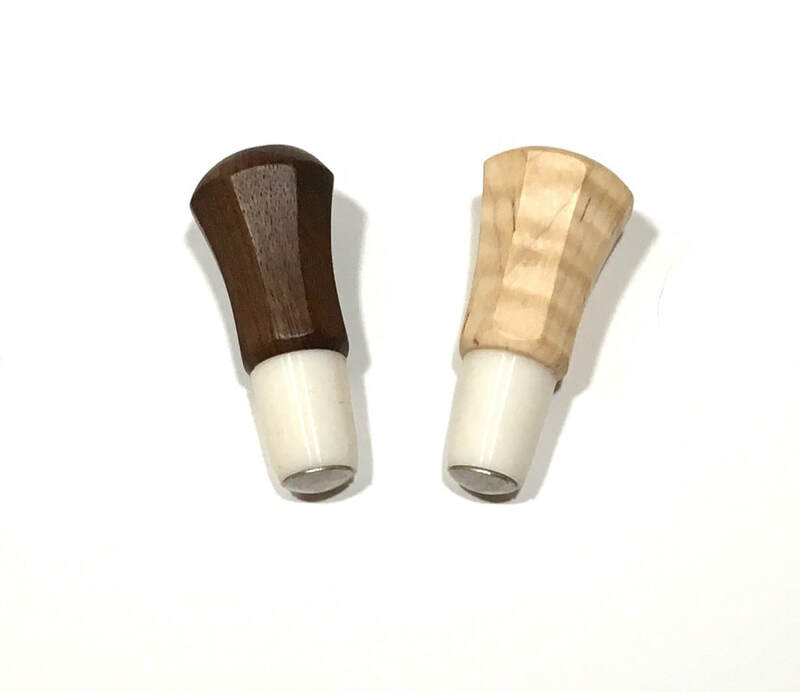 Our stoppers are made with surgical grade rubber and stainless steel -- and they will not absorb odors, colors, or flavors. They'll keep your prosecco bubbly too -- Someone had to do that experiment, and I was more than happy! 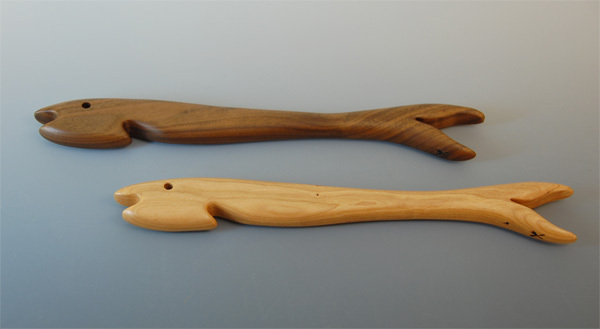 Available in three shapes: Jewel, Violin, and Whale - in our three popular woods: Black Walnut, Curly Maple, and Cherry. Helping Hand for the Chef or Baker. Just what your fingertips would do if they were pointy! of chopped vegetables. Or grated cheese. Or peels and seeds. Or for sliding a pie crust or bread dough into place. and keeps pretty wood grain in view. These coasters use the natural wicking ability of end-grain wood to keep your surfaces safe from condensation, moisture, and heat -- plus the felted bottoms are gentle on your surfaces! ​We sell them individually or in sets of 4! Perfect housewarming present or hostess gift. The small bowls are great for salt, wasabi, crushed red pepper…. As well, they’re the perfect size for wedding rings while washing dishes, a shell from a great walk on the beach—even hearing aids! AND they’re an ecological use of small nuggets of beautifully-grained wood. Just right for shaking salt evenly. These little ones are so small to make on my big machines—I often say they’re just a second away from being a toothpick! 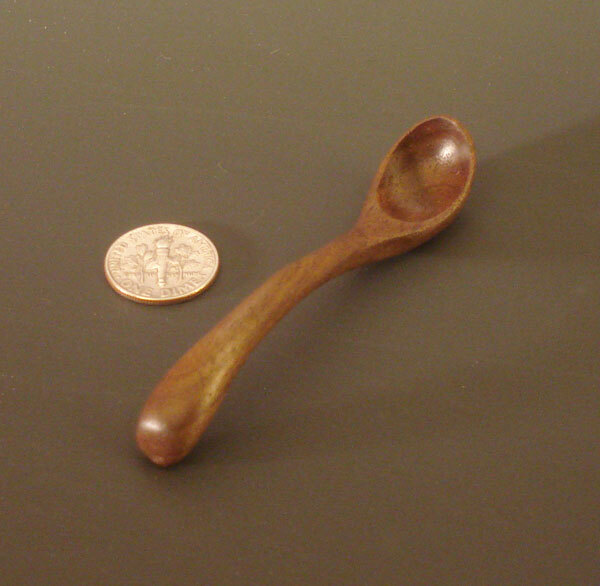 They seem to bring out the little girl in us older gals—young visitors to our booth see them as a tiny ladle for dolls. Spoon Rests and our custom ordered Small Bowls have the same silhouettes —the spoon rests just have a notch for the spoon handles. Tom and I use our spoon rests on the stove AND on the dinner table. The label contains instructions for use. Here it is - bottled up for home use - the wonderful, food-safe oil we use in our workshop. Now you can maintain the gorgeous luster your piece had when you brought it home, plus you can revive tired, older pieces as well. It’s a pure heated linseed oil--not the inedible kind from the hardware store with chemical dryers--which penetrates and enhances the grain. Linseed oil is derived from the dried ripe seeds of the flax plant and hardens to a tough, resilient film after exposure to air. 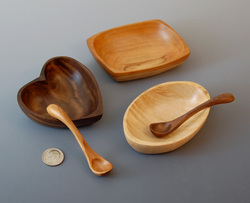 See our Woodenwares Care page for photographs and further instructions. 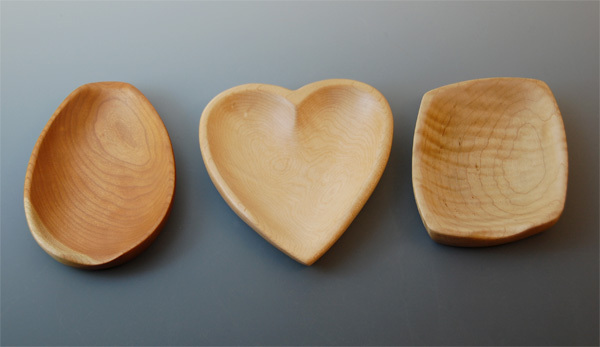 A bottle of oil enhances any woodenware gift! Boiled Linseed oil poses a risk of spontaneous combustion if not disposed of properly. After oiling your pieces, make sure to lay each rag or towel out flat to dry before placing in rubbish bin. Improper disposal of used oil rags could result in trash bin fire. For any further questions, please review the Material Safety Data Sheet for Boiled Linseed Oil.